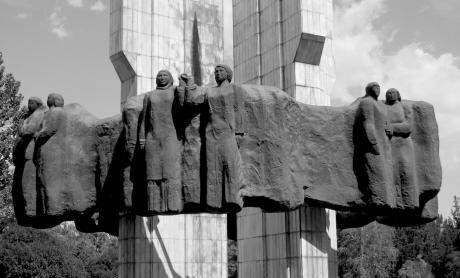 Monument in the center of Bishkek, the capital of the Kyrgyz Republic. Photo CC-by-2.0: Alex A. Butler / Flickr. Some rights reserved.In Kyrgyzstan, independent publications are being shuttered left, right, and centre on far-fetched and often absurd pretexts. The authorities frequently bring criminal cases against human rights activists and journalists — in other cases, the state slams them with huge fines or seizes their property. The unlucky ones who haven’t yet managed to flee the country end up behind bars or are banned from travelling abroad. We might as well rename the country — Absurdistan, perhaps? Due to its relatively free environment for the media, Kyrgyzstan was once known as an “island of democracy” adrift in authoritarian Central Asia. That island is now sinking into a swamp, and the final cries of its once-famed freedom of speech are all that’s left to publish. Take it from me — my own experience in recent months is proof enough. Early this June, the investigative department of the State Committee for National Security (GKNB) opened a criminal case against me, under Article 299 Section 1 of Kyrgyzstan’s criminal code — that is, for “inciting hatred between different ethnic, racial, religious, or regional groups.” The catalyst for this was my article entitled “People, like animals.” The text was published by the Fergana News Agency, and included examples of incitement to violence against “Sarts” (an offensive term for Uzbeks) on Kyrgyz-language social media. My article was declared “extremist material” while Fergana’s website was blocked in Kyrgyzstan. I pointed out that particular users on social networks were openly inciting violence against an ethnic minority, and wondered why the security services — usually so diligent in unmasking critics of the president online — didn’t react whatsoever to these posts. Instead of bringing these provocateurs to justice, the GKNB blamed me. However, I suspect that the true reason for their reaction lies elsewhere: a few days before the publication of the ill-fated article, Fergana published my text about what awaits Kyrgyzstan should Sooronbai Jeenbekov win the presidency. 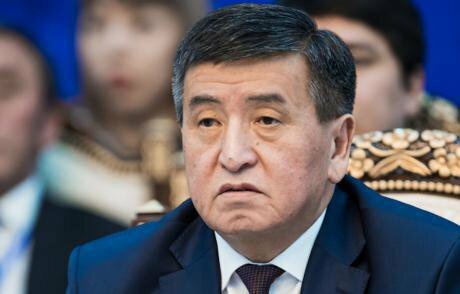 Jeenbekov, who was prime minister until last month, is strongly supported by outgoing president Almazbek Atambayev, who has presided over this crackdown. There was another article, too — named “Wahhabi Kyrgyzstan — where will the brother of the future president taking the country?” in which I presented to the public the possibility of a rise in Arab influence in the country, via networks with which the Jeenbekov family is closely tied. I noted that Jeenbekov’s older brother, the 62-year old Jusupbek, is currently Kyrgyzstan’s ambassador to several Middle Eastern countries, including Bahrain, Egypt, Jordan, Kuwait, Morocco, and Qatar. The current Prime Minister of Kyrgyzstan (and, most likely, the future president of the republic) Sooronbai Jeenbekov at a meeting of the Eurasian intergovernmental council, March 7, 2017. Photo (c): Tabyldy Kadyrbekov / RIA Novosti. All rights reserved. Of course, this whole matter can also be seen as an attempt by Atambayev to settle a few scores before leaving his post. Indeed, the president even said as much during his speech on the seventh anniversary of the clashes in southern Kyrgyzstan (following the ousting of second president Kurmanbek Bakiyev in 2010, violence broke out between the Kyrgyz and Uzbeks of Osh and Jalal-Abad in June, displacing tens of thousands - ed.) “Unfortunately, we also have people here in Kyrgyzstan who wittingly or unwittingly play along with those forces interested in hampering better inter-ethnic relations. Under the guise of experts, journalists, or human rights defenders, they’re trying to aggravate inter-ethnic tensions” — quotes the presidential press service. I soon realised that I was facing arrest and a show trial, so I fled the country, leaving my family behind. For obvious reasons, I cannot reveal my whereabouts. However, I still follow developments in Kyrgyzstan from afar, keep in contact with my colleagues in the media, with activists and with politicians — that is, while the lines of communication remain open. Another telling case took place on 22 August, when the Pervomaysky district court in the capital of Bishkek decided to close down the digital TV channel September. 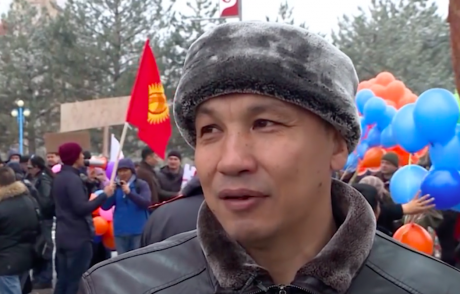 The channel was connected to Omurbek Tekebayev, a leading opposition politician and leader of the Ata-Meken party. Literally a week earlier, Tekebayev had been sentenced to eight years in a high-security prison on a corruption charge. Allegedly, whilst a member of the provisional government after the revolution of 2010, Tekebayev received a million dollars from the Russian businessman Leonid Mayevsky in exchange for a place in the management of Alfa Telekom (a MegaCom brand). Tekebayev was arrested amid a growing confrontation with president Atambayev. Not only did he strongly resist the president’s proposed amendments to the constitution, but even started to publish information about the property of the Atambayev family. The opposition leader had even planned to initiate the procedure to impeach president Atambayev in March. In the very same interview Kaparov accused Sooronbai Jeenbekov and his brother Asylbek of “embezzling three million dollars allocated to stabilising the region following the events June 2010” (the two men were regional governor and speaker of parliament at the time). The general prosecutor’s office also submitted these words to “expert analysis” and promptly declared them “extremist” too. At the crux of the case against September was the fact that the local analogue channel in Jalal-Abad also happened to be named “September”. This unfortunate coincidence would seal the fate of the larger, digital TV channel. The analogue channel in Jalal-Abad on which these statements had been broadcast was closed down last year. This was related to me by Kaiyurgul Urumkanova, a representative of the (digital) September TV whom I interviewed for my article about the closure of the channel for the Fergana News Agency. She also added that the founder of September TV was an entirely different legal entity, with no links to the channel in Jalal-Abad. Not that it seems to matter. Staff of September TV who were questioned in court weren’t even given time to familiarise themselves with the accusations against their channel, and were not even shown the lawsuit itself. 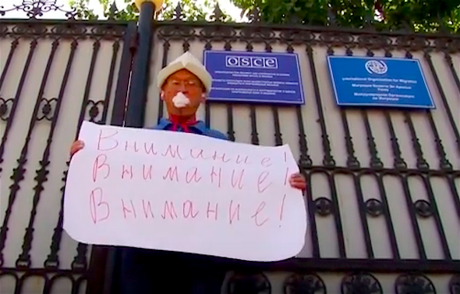 A representative of the independent press holds a picket near the OSCE building in Bishkek, on August 24, 2017. Photo: YouTube / Zhalbirak TV. Some rights reserved. “They called us up during the live broadcast of our morning entertainment programme and told us to come to court at 2 PM,” recalls Urumkanova. There was no official summons, so the editor-in-chief Kanyshai Mamyrkulova went to court and asked them to postpone the meeting for another day, due to the fact that nobody at September TV had been told the reason for [what was happening], and the channel hadn’t yet managed to issue power of attorney to a lawyer. 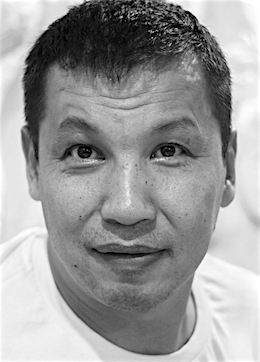 The author of the article during march in support of freedom of speech in Kyrgyzstan. March 2017. Photo: Present Time / YouTube. Some rights reserved.I remind readers that Kyrgyzstan’s main supervisory office is overflowing with lawsuits against the publications named by Akayev. The total sum of the claims against them now exceeds 30 million som (approximately £335,000). All were settled. Meanwhile, the courts did not take into consideration any arguments made by journalists or their defence. Tekebayev’s statement at a press conference on the matter sums it all up — the sums demanded in the lawsuits are disproportionate and ruinous for the media outlets and for their employees. However sad it may sound, it’s time to say goodbye.